For years, businesses have looked at new fans as the holy grail of Facebook. But what if there was something better? Another level of fandom where people who “Like” your Facebook Page don’t only see your content from time-to-time but actually request to be told everytime you post or share a photo. It’s not as crazy as you think. In fact, Facebook has already started rolling out a new feature to let users do just that. Also, it was a big week for halves–with half of all Yelp searches coming from mobile, half of top companies hopping on Instagram, and half of all users feeling more excited about the emails they receive. Read about all these top stories and more in this week’s marketing new roundup. Facebook began to roll out a new feature this week, which could help brands improve the likelihood of actually getting their content seen by fans on Facebook. 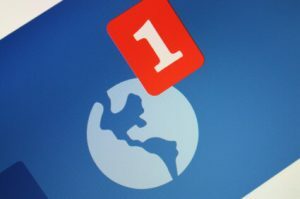 According to Facebook, the new Page Notifications feature will give users the capability to elect to receive notifications from their favorite Pages. The tool is meant to let users stay better connected with the Pages that matter most to them. Bottom Line: Page Notifications is good news for small businesses. Let’s face it, getting the attention you want on Facebook isn’t always easy, and with Facebook’s ever changing EdgeRank algorithm–it isn’t getting any easier. This feature could allow businesses to get better visibility on Facebook, but only if users choose to receive notifications. And this means that building a quality fan base is more valuable than ever. If you’re not already, you should spend some time thinking about how to improve relationships with your current fan base. These are the people who will be able to elect to receive notifications and will also help generate the type of word-of-mouth that can help you grow your business. According to new statistics from Yelp this week–45% of all searches on the local review site are now coming from mobile devices. Yelp also reported that the company added nearly a million new mobile users–with 8 million people now using the site’s mobile apps on their phones and tablets. Bottom Line: Yelp’s surge in mobile search activity should not come as a surprise to anyone. Over 40% of all local searches have local intent. These are people that are currently living or visiting your area, searching for a specific product or service, and who are hoping to discover a local answer to their questions on their mobile devices. For many of those mobile users, Yelp is the first stop for finding those answers. Here are 8 more things small businesses should know about the future of mobile marketing. Facebook announced a new feature this week that may change the way we think of Facebook Gifts. Facebook Gifts, which launched in September, enables Facebook users to to buy and send physical gifts from a select group of well known retailers. Now Facebook allows you to send a gift in the form of a charitable donation. Facebook currently partners with 11 of the nation’s top charitable organizations including the Red Cross, the Boys & Girls Club of America, and LIVESTRONG. Bottom Line: While Facebook Gifts hasn’t opened up to small business, or in this case – smaller nonprofits, it will be interesting to see how much activity this new feature draws. If you’re a nonprofit, it’s likely you’re already using social media to engage supporters, and while you may not have access to Facebook Gifts–you can still drive real fundraising results from your social media marketing. New research this week is providing a positive outlook on how consumers are viewing the volume of emails in which they receive. According to the study, which included just over 1,000 U.S. adults, 54% of consumers are happy with the volume of emails they are receiving from brands. The same study also found that over a third of respondents are “very interested” in receiving email communications from their “preferred brands.” Find out what else the survey had to say about how consumers may be viewing your email marketing. Bottom Line: Businesses of all sizes have learned that spamming customers with unwanted emails just doesn’t work. But when you deliver relevant content and focus on building relationships with customers, they look forward to receiving your emails each month. That’s how you become a “preferred brand” and that’s how you generate real results from email marketing. There’s plenty to look forward to about the future of email marketing. Here’s a snapshot of what you’ll need to know. The popularity of Instagram amongst social users appears to be catching the attention of some of the nation’s top companies. A new study from SimplyMeasured found that 54% of the top 100 companies are now on Instagram. Up from August when just 40% of companies were using Instagram to market their brands. Bottom Line: Instagram’s popularity has been well documented over the last few months. For businesses, Instagram presents an opportunity to not only engage with a growing user base of over 100 million users but also a chance to create engaging visual content that can be shared across social networks. Find out how other small businesses are already using Instagram. What do you think of the new Facebook Notifications feature? Do you think it will help businesses like yours get better results from Facebook? Share your thoughts with us on our Fan Page!